Happy Thanksgiving everyone!! I hope you are all able to spend some time with loved ones and remember all the things you are thankful for. As for me, I have so many things that I am grateful for. I feel extremely blessed to be surrounded by so many amazing, loving, and inspiring people and feel so lucky that I have everything I need and more. I’m thankful for my beautiful, healthy and brilliant daughter and my too-amazing-for-words life partner who gets me, accepts me and loves me though anything and everything. And I’m so grateful that I get to do things that I love like sew, take pictures and blog and that people are encouraging me to pursue one of my dreams. Thank you!! I have been able to be super productive recently because I’ve had some rare time to myself (another thing that I’m thankful for!). After working on a lot of things for other people, I wanted to take some time to make something for Yuki. I’ve had this image in my mind of a simple coat and I finally had the chance to try it out!! I’ve never made a jacket or coat before because it always seemed so intimidating. I’m glad I finally gave it a shot and I learned A LOT from this experience. Although I’m pleased with the way it came out, I’d definitely do a few things differently next time. 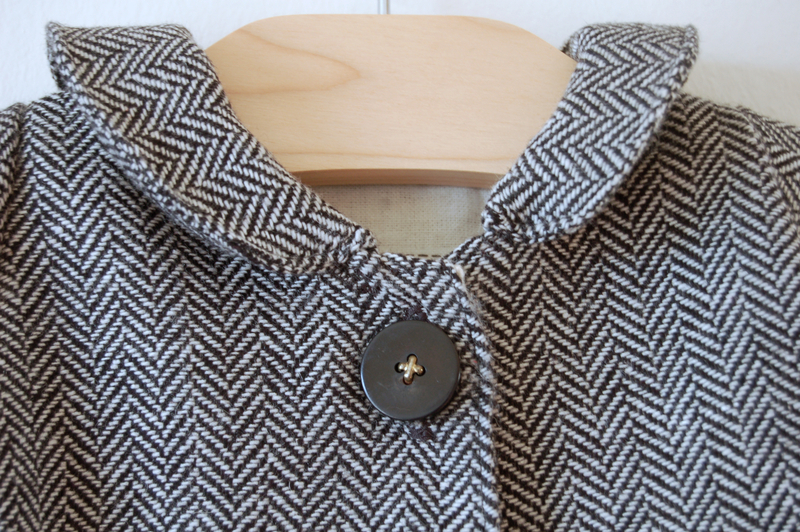 Anyways, here it is – the Herringbone Short Coat! It’s lined with some super soft flannel. This is my first Peter Pan collar and it did NOT turn out as I expected (more on that later) and a random button that I found in my button jar that I LOVE. 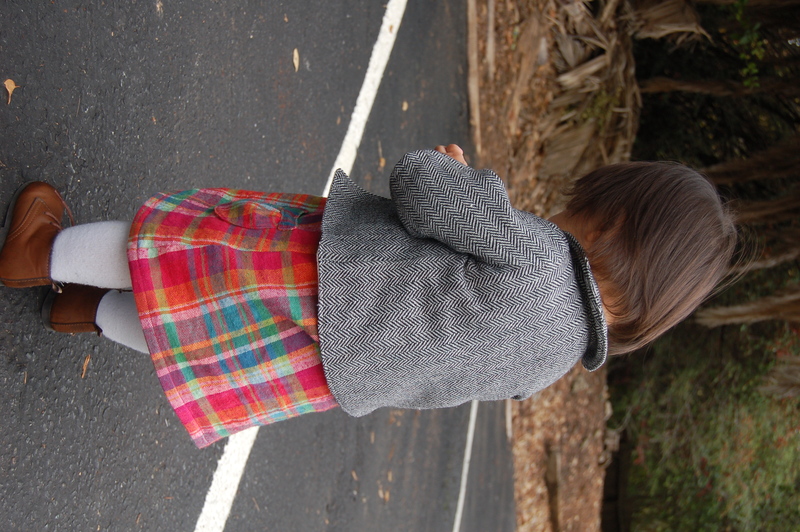 I used a wool blend herringbone fabric that I picked up out of the remnant bin at Joann’s. It was only 1/3 yard!! So I didn’t have much to work with. I love the slightly dressy look, but it isn’t very practical since I can’t just throw it in the wash. It’s also a very loose weave so it unravels like crazy! The original design for this jacket had a hood, but I decided to nix that for this coat. Yuki has so many hooded jackets and she doesn’t even like wearing the hood (plus, I probably wouldn’t have had enough fabric for that anyways). I’m glad I went for the Peter Pan collar, but it sure was harder to do than I thought. The collar turned out way smaller than I’d hoped and I didn’t know how to attach it, so that resulted in some creative (sloppy) sewing. If anyone can help me with attaching a collar to a lined jacket/top, PLEASE share! The other problem with the jacket is that it’s SNUG on her! Which means that she’ll grow out of it by next week! And you better believe she’s going to wear it every day until then! I definitely want to make this coat again, but with some adjustments. What kind of fabric should I try next? Here’s some pictures of the coat in action. 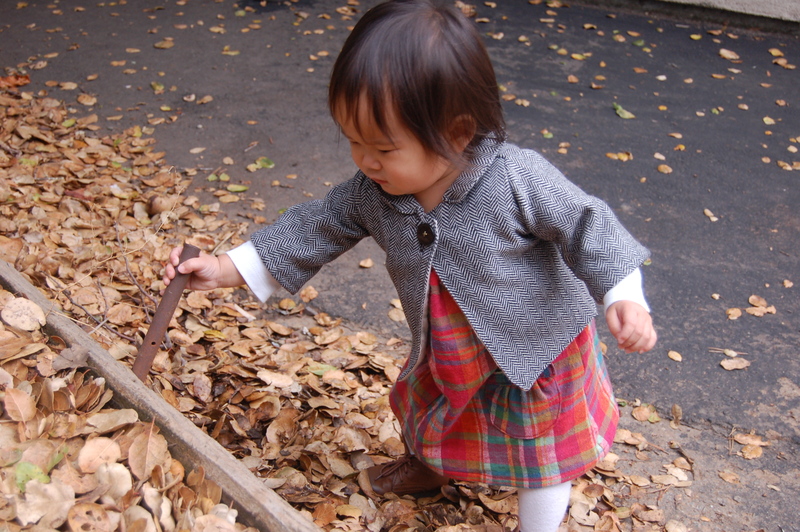 She’s wearing it with a jumper that I also made so she’d have a complete outfit for Thanksgiving. I’m going to share all about the jumper in another post. 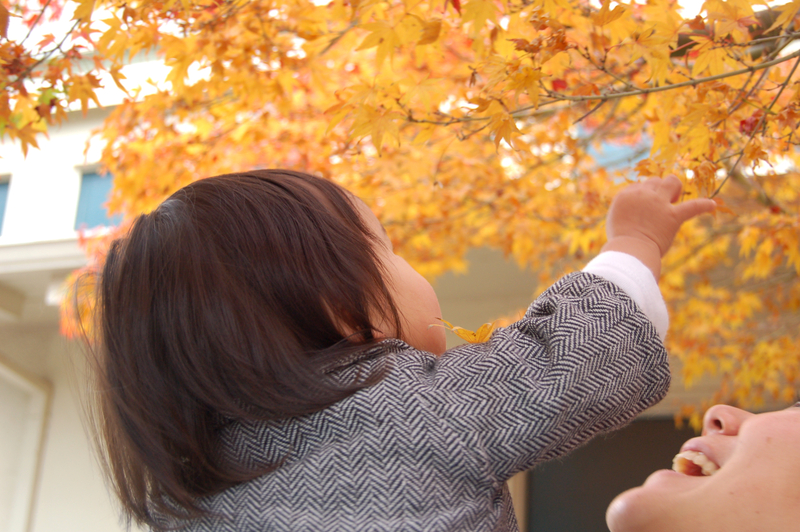 Oh, how we love the fall! I hope you all enjoy the long weekend filled with delicious food and good company! Happy Thanksgiving! 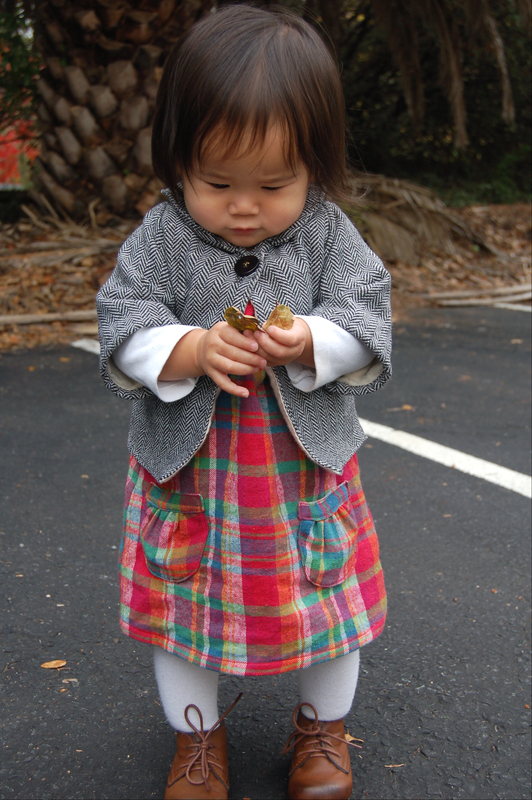 This entry was posted in sew & tell and tagged girls, herringbone, jacket, jumper, sew & tell, short coat, thanksgiving by Cherie. Bookmark the permalink. I stumbled here via Pinterest and just had to say that the coat and jumper are adorable! Having an adorable model doesn’t hurt either. 😉 If you don’t mind me asking, what pattern did you use for the coat? Thank you!! And yes, the model makes just about anything look 10 times cuter! I usually make my own patterns, so I don’t have an actual pattern for the coat. 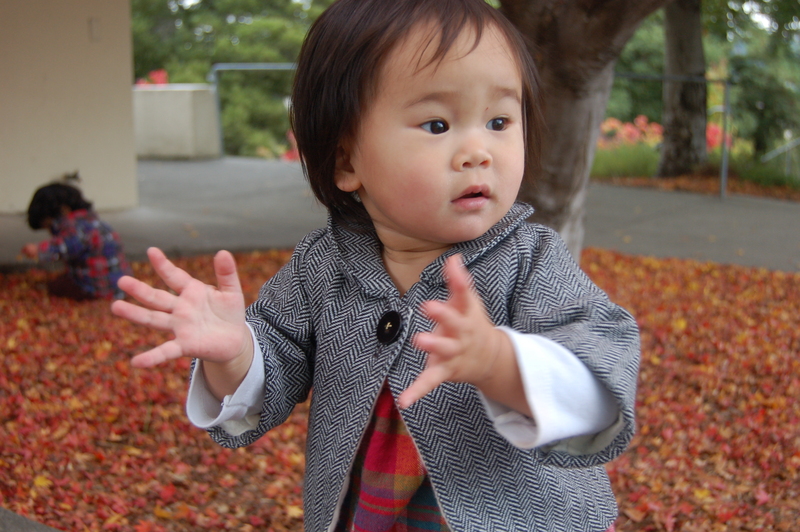 I took a jacket that fits her and used that to make a general pattern (there are lots of resources on the internet about how to draft your own pattern, if you need). Then I shortened and widened the sleeves and added the collar using a tutorial I found online. Sorry, this probably isn’t very helpful. Good luck and thanks for stopping by! Thanks! I have drafted a few patterns, but only for simple things. Maybe I’ll work up the courage to try a coat sometime. 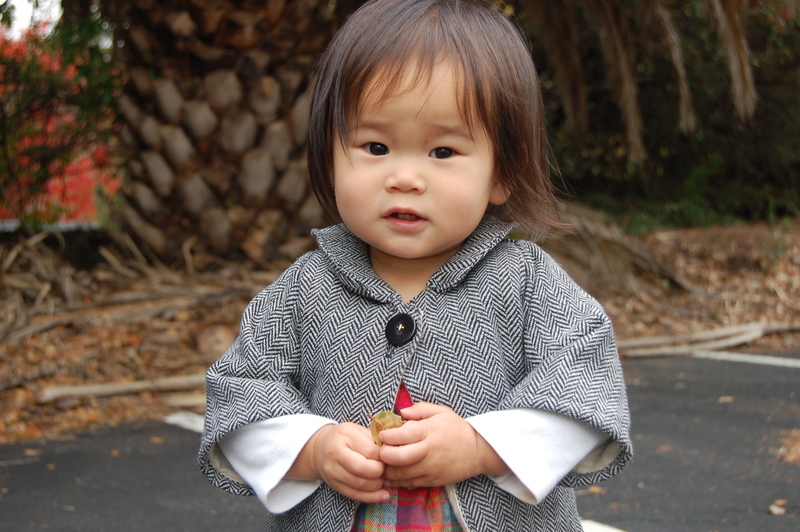 I’m actually in the middle of drafting a coat pattern for my baby girl in a very similar wool herringbone! 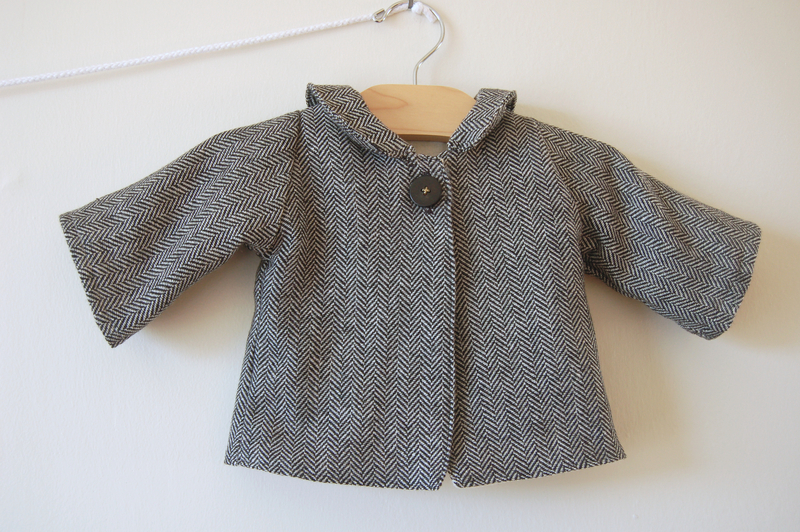 I’m sizing up a now-too-small coat I made for her from a pattern I made myself, too. Yours turned out great and I love those wide sleeves. How did you do your lining? Is it the same pattern pieces as the outside or did you make it bigger (to allow for movement etc.)? Hi Emily! I used the same pattern pieces for both the lining and the main fabric. I think that if the lining was any bigger than the main fabric, you’d end up with that fabric being baggy or bunching up inside or even hanging out of the coat, you know? I’m not entirely sure though. The one time I used a purchased pattern to make a lined coat, the lining and main pieces were cut from the same pattern pieces as well. I hope this helps!! 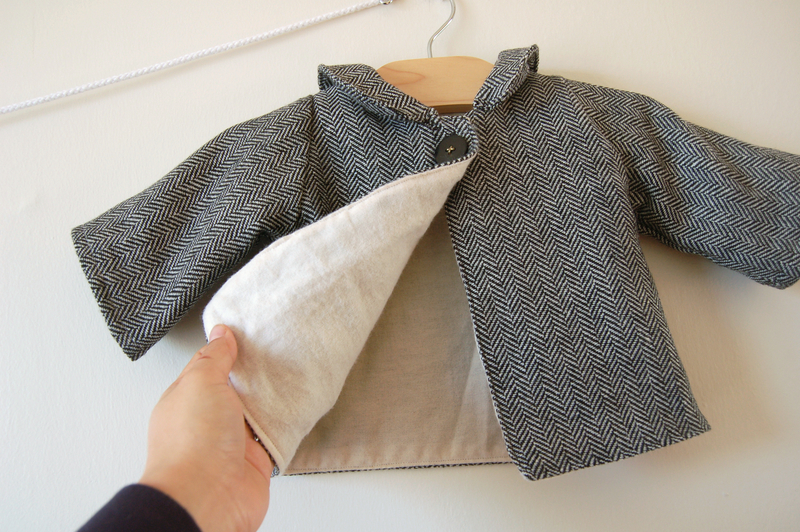 Well, grown-up-sized jackets and blazers are usually made with lining that’s slightly bigger–in my understanding, you add a crease in the bottom, and some pleats inside to take it in so it doesn’t bag. But I’m glad to know, for simplicity’s sake, that you made it from the same sized pieces. Was your daughter able to move comfortably in the jacket? It didn’t pull at the shoulders or armholes at all?